There are a few games in our opinion that have been forgotten. This “Magical Realm of Forgotten Great Games” has many members; Beyond Good and Evil, Vandal Hearts and Parasite Eve to name a few. 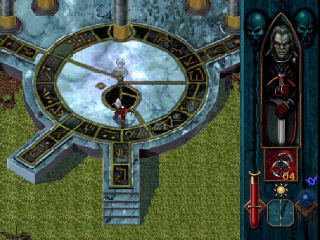 While other games were filled real life actors that were terrible and voice acting that was even worse, Blood Omen Legacy of Kain nailed storytelling and voice acting in a way that had no equal during the console life cycle of the PS1. This top down action game it was released in 1996 and is still a staple how great story, plot points and voice acting has nothing to do with technology. As night hits you are warned that nobody should be on the streets. You are Kain a young nobleman who is about to killed by assassins and you don’t know why. Upon your death you find yourself in kind of a middle spot between heaven and hell. An ancient necromancer named Mortanius offers Kain a chance to go after the men who killed him and seek his revenge. Not knowing what his offer means Kain accepts and is turned into a vampire and is set free back into the world of Nosgoth. After taking out the group of assassins Kain is told by Mortanius that the Circle of Nine a corrupt group of godlike sorcerers were the ones who sent the assassins after him and he should destroy them too and in the process he will find a cure for his new found vampirism. Certain games just get better with age. We can’t believe how much fun this game still is. You start playing and just don’t want to stop, The flawless progression of the story, the deep development of the characters and one of the only games on the PS1 to have outstanding voice acting, This could be the best story driven and voiced acted games on the PS1. Combat is action based with magic elements. It is like many modern day MMO so if you have experience with World of Warcraft or other games with this style you will feel right at home. We had no camera issues. You can zoom in and zoom out and it still looks good on a HDTV. Fighting almost always works but sometimes you think that you are close enough to attack or far enough away from getting hit and you find out you are wrong. You can’t move and attack at the same time. It is not to bad but it takes some time to figure out. We have spent hours playing this game and to the current PSN download and we still want to try it again. The game took us about 12 to 15 hours to play through and has very high replay value because of how good the story and gameplay is. The magic spells are unique and adds to the combat and you even get to turn into a wolf, a bat and a magic mist to get into special areas. Just spent the $5.99 on PSN it is worth it!